Alpha releases are pre-release versions of the software that are still in active development. We release them to a small group of customers so we can get feedback and quickly identify and fix any problems before the public beta release. If you want to take part in the test phase reply or comment on to this post or contact us. You can use pre-release versions of Analyse-it alongside your existing version of Analyse-it, so it won't disrupt your work. And, if you help during in the test phases you will get a discount on the upgrade (a free upgrade for those who contribute the most) when the product is released later this year. This latest alpha release includes linearity and precision analysis, plus diagnostic test performance (ROC analysis and binary test performance) and reference intervals from the 1st alpha. Graybill-Wang / Ting-Burdick-Graybill-Jeyaratnam-Lu modified large sample confidence interval estimators for variance components – produces confidence closer to the stated level than Satterthwaire confidence intervals, which can be too liberal. Support for unbalanced 1-way and 2-way nested random ANOVA models. Harrel-Davis, Bootstrap, and Robust Biweight quantiles. 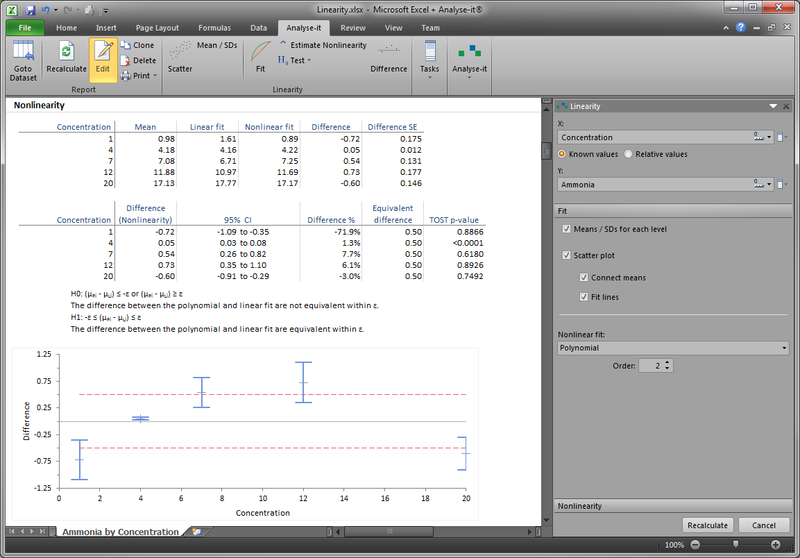 Would you consider adding sigma metrics to analyse-it? Was at a workshop with Dr Westgard recently and he really opened my eyes to the potential uses of six-sigma and sigma metrics in the clinical setting. We do have plans to extend Analyse-it into Statistical Process Control / Six Sigma in 2014. I'll let you know when we start work on that product so you can contribute ideas and provide feedback during development.